Damn sure he'd git money outta you! "Step right up ladies and gentlemen, won't ya?" "Rev'rin Bobby's got some news tah tell!" "Right here in this bottle is a bow'nafide brew"
"That'll keep ya from goin' tah HELL!" "It'll cleanse the body of your sins!" "Make your mind right.. your morals right.. and more!" "Repent, friends! Don't let the devil win!" "For TWO dollars you can have one of these"
"It'll restore you to the way God first made ya!" "It'll shine your hair like mine.. 'n help ya see!" "Give ya energy of a new pup!" "Ohhh, what's hap'nin? What's this stuff doin'?" "It's scarin' the devil outta me!" Hi and thanks for stopping by Scarlet's Rhymes! you must scroll down this page to the October 7, 2006 entry. You will see a "TV Set" with Snowetry written in it. Turn up your speakers and click on it! 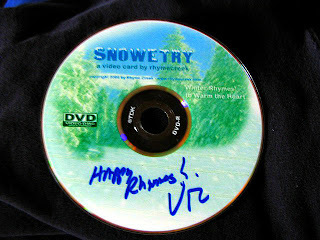 what you think of the awesome SNOWETRY! !